This might be your lucky day because DefaultCase are selling their iPhone 4 cases for just $0.01, yes just for one penny. DefaultCase claim that there is not hidden fees or catches behind this ridiculous price. Of course there is a shipping fee of $3.99. These hard shell perforated cases come in six colors with a soft-touch coating. Remind you of some other case you've seen in the past? 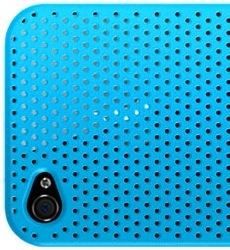 They do look very similar to the Incase Perforated Snap case for the iPhone 3G/S, but I'm not complaining. Don't think you can score more than one case per shipping charge, because DefaultCase will charge a shipping fee on every single case ordered. Hit up the source link for more.